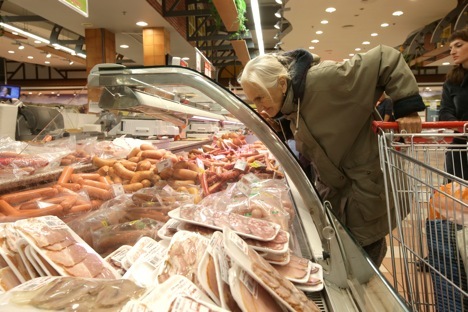 Russia’s food embargo involves a one-year ban on meat, fish, dairy, fruit and vegetable imports from the countries that slapped sanctions against Moscow. The relevant agencies mentioned a number of food items on which the embargo should be expanded: canned fish, chocolate and flowers. Russia’s Agriculture Ministry will prepare an updated food embargo list with stricter requirements for the import of certain products from the West, a ministry source told TASS on Wednesday, adding that "the document is still under development in the Agriculture Ministry and will soon be submitted to the government." He confirmed the previous expert community’s assumption that the document will toughen requirements for the import into Russia of certain categories of products: "Yes, the list contains more stringent requirements for the import of certain types of products." The source declined to specify these products. The Russian Agriculture Ministry’s press service declined to comment on the situation. Presumably, stricter requirements may be introduced, in particular, for lactose-free dairy products. Russian Deputy Prime Minister Arkady Dvorkovich told TASS previously that the lactose-free dairy products would be imported into the Russian Federation only on the basis of special registration. The Ministry of Agriculture proposed to restrict the imports of lactose-free milk products from the EU countries, under the guise of which a great amount of cheese from the "sanctions list" is supplied to Russia. The relevant agencies also mentioned a number of food items on which the embargo should be expanded: canned fish, chocolate and flowers. However, Agriculture Minister Alexander Tkachev told TASS he did not consider it necessary to expand the sanctions food list in case of the embargo extension. Russia’s national dairy producers union, Soyuzmoloko, said previously that since March 2015 France, Italy and other EU countries have significantly increased the exports of lactose-free milk products to Russia. France exported to Russia 78.4 tonnes in January-February, compared with 304 tonnes and 120.6 tonnes in March and April, respectively. Italy supplied 30 tonnes to Russia in January-February, compared with 50 tonnes and 49 tonnes in March and April, respectively. Russia introduced an embargo on food imports in August 2014 in retaliation to the sanctions imposed by the United States, Australia, Canada, the European Union and Norway against Moscow over its stance on developments in neighboring Ukraine. Russia’s food embargo involves a one-year ban on meat, fish, dairy, fruit and vegetable imports from the countries that slapped sanctions against Moscow. The Russian government softened its food embargo later that month by excluding lactose-free milk products from the list of banned imports. Since then, these products have been supplied to Russia under a declaration of compliance.